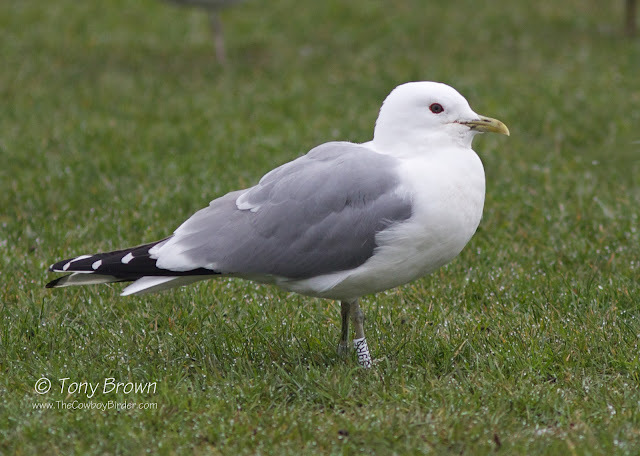 The blog title isn't a reference to dear old Mr Vaughan but Common Gull J9R5 which is still lingering on the Flats - the old boy is a regular Winter visitor to Wanstead and is at least 22 years old having been ringed as an adult in 1998 in Bergen, Norway. The majority of the Common Gulls have now left for another Winter and J9R5 will also soon be heading north for the summer, here's hoping he returns next Autumn. The Gulls were the only birds of interest as I covered the Flats on Saturday morning, although I did spend a fair bit of my time checking every Corvid which flew over as Rook continues to elude me. As we approach the end of March Wanstead is currently struggling to record any early Summer migrants, with just a couple of singing Chiffchaffs being new for the year. So apart from Rob's Wheatears on the 16th, we're yet to see a Sand Martin, Swallow or a Little Ringed Plover - but with the long Easter weekend on the horizon this could all change very quickly. The Beast from the East...Delivers!